【COMPREHENSIVE FUNCTIONS】:It shows current speed while driving and the time of arrival, having the option to find alternate routes or avoid a specific street/highway. Only to do updates; otherwise, no WiFi/internet is needed. 【LIFETIME UPDATES】: We have pre-installed the latest North & South American maps. The new map will be updated at first and last quarter of 2018. The package included the steps to update the maps. If you have any questions, please contact us. 【SUPPPORTS 7 VEHICLE TYPE】: Car, Truck, Pedestrian, Bicycle, Ambulance, Bus, Taxi. You can select according to your vehicle type. 【Hi-Fi SPEAKER&FM TRANSMITTER FUNCTION】: navigation voice and music will be sent directly to the car's speakers, volume adjustable; voice remind the speed limit and making a turn, main street names(some remote areas might not recognize). 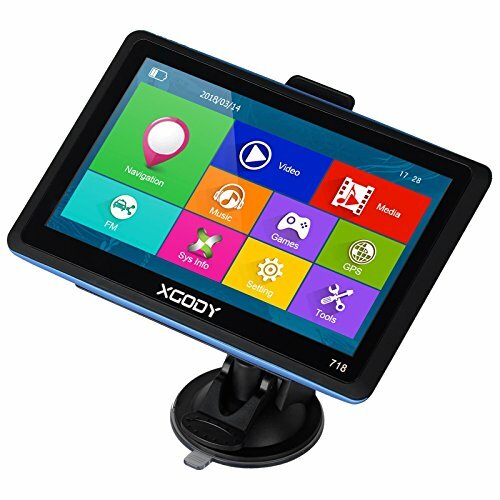 【7 Inch CAPACITIVE TOUCH SCREEN&ADVANCED LANE GUIDANCE】: 7"color display touchscreen is clear and sensitive. never miss your exit or turn with Advanced Lane Guidance. It shows you exactly which lane to take before you approach an exit, turn or difficult intersection-so you can stay on the right path.